If you stand still long enough these days, somebody may pipe a swirl of frosting on your head. I seem to hear about a new bakery or new offerings at an old bakery almost every week. On Thursday, I hefted the GPS and a fork and hit the road to check out a few places. Chip Nutty Cookies: Chip Nutty took a long time to come out of the oven. Owner Charles Rivers has been making 21 flavors of cookies that he sells at small stores, flea markets and special events. But he wanted to aim for bigger stores, like supermarkets, which meant he needed a bigger oven. So he opened a bakery at 5920 South Blvd., near Archdale. Fans of Mexican cookies may remember it as the old Panaderia La Mexicana building. 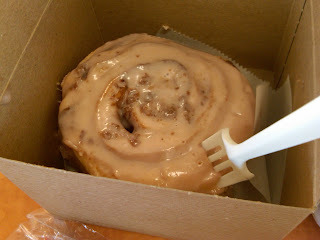 In addition to a rainbow of cookie flavors, including strawberry smoothie and king lime, they also have cinnamon buns with flavored toppings like strawberry (that's the strawberry, nicely rewarmed and served in a box with a fork), doughnuts and bags of small cookies. Cookies range from 99 cents for the little bags to $1.29 for a single big cookie. I stopped by Jimmie's Sweets, 131 Matthews Station Street in Matthews, to check on one of my favorite local cookies, their caramel crunch cookies. 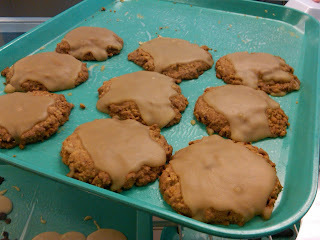 They're holding up well: Still a crunchy cookie covered with that amazing solid caramel icing. Just checking. 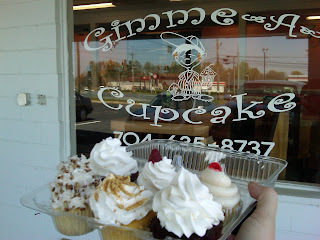 Finally, I ended up in an unlikely spot at a country crossroads outside Monroe to check out Gimme A Cupcake. Take U.S. 74 to Morgan Mill Road, turn left and it's about 1/4 of mile down, at the intersection with Sutherland Road, in the building next to a lawnmower repair shop. Gimme hasn't been open long, but it already has passionate fans. One caller was so enthusiastic, I was afraid she was going to try to squeeze a peanut butter and jelly cupcake right through the holes on my phone. I see her point, though: It's a sweet little sweet shop, with a rotating list of flavors that changes by the day. I got a half-dozen for around $10 and tried Italian Creme, that PB&J, Grandma's Lemon Icebox, Red Velvet, Piano (chocolate cake with vanilla icing) and Razzle Dazzle Raspberry. Verdict: Good, moist cake with very fluffy, very tall buttercream icings. Check out the daily list at http://www.gimmeacupcakenc.com/. Remember: Tuesday is Maple-N-Bacon day. Give me a call -- I'd be willing to try that "cupcake through the phone" trick. Mama said there'd be days like this . . .